The following available state data imports for California State Assessments are listed below. The Summative (Preliminary) data was available to allow stake holders quick access to results from the SBA until the final data was made available. However, the preliminary data should no longer be used once the final data is imported, so once users import data using the "2014-2015 CAASPP" dataset, the import will remove all data and references to Summative (Preliminary) results. How do I import 14-15 CAASPP data? 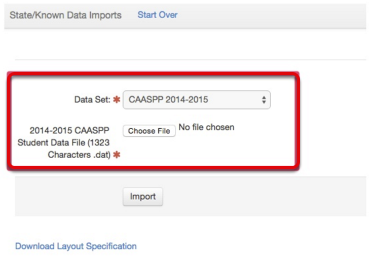 Navigate to the Admin Gear > State/Known Data Imports and select the import titled "2014-2015 CAASPP". Ensure that the CAASPP file ends in ".dat" which is obtained from TOMS and matches the description before importing to ensure a successful import. How does the CAASPP import match students in Illuminate? Student's are matched using the SSID that originates in CALPADS. The CAASPP data file no longer includes the Local Student ID. Please ensure that SSIDs exist for students in Illuminate before importing results. Why doesn't the Question Group Widget display any 2014-2015 CAASPP data? Currently, we are investigating how best to display achievement level data at the claim level where previously the measurement was percentage based. Please reference the 14-15 CAASPP Post Test Guide (pg 9 -10 Chapter I.3 Interpreting Results) for more information. 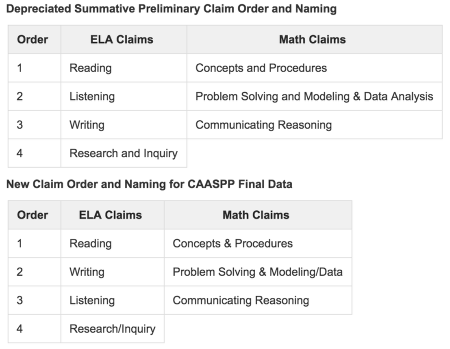 Why is claim order not consistent between the Summative (Preliminary) and Summative (Final)? On August 27th, caaspp.org released a new student data file layout that has changed the order of the claims. We do not know why this occurred but the pre-built reports in Illuminate will reflect the order of the most current specification provided. Above is a table that shows this change. I imported my CAASPP data, why are my Summative (Preliminary) results gone? Where do I find my EAP results? 2012-Prior: Data Layouts not available. 2011-2012 and Prior: Data Layouts not available. 2011-2012 to Prior: Data Layouts not available. 2010-2011 through Prior: Data Layouts not Available. 2010-2011 to Prior:Data Layouts not Available. See all info related to SBA here. STAR 2010-2011 through Prior: Data Layouts not available. Now that you have reviewed the available state assessments for import, learn how to use the Upload State Assessment Data.